myOMA (my Open source Maintenance App) est une GMAO (Gestion de maintenance assisté par ordinateur) pour petite et moyenne entreprise. Ce projet est en phase de démarrage et une première version sera publiée vers la fin 2018. C'est une application basée web et open source. Le financement du projet se fera à l'aide de publicité ciblé (Adsense). et bien d'autres encore, selon les demandes et les besoins des utilisateurs. myOMA (my Open source Maintenance App) ist eine Komputer gestütztes Wartungsmanagement Software für kleine und mittlere Unternehmen. Dieses Projekt ist in der Startphase und open source. Eine erste Version ist fü Ende 2018 geplant. Es ist eine Web basierte Applikation. Die Finanzierung des Projekts wird durch gezielter Werbung finanziert (Adsense). myOMA (my Open source Maintenance App) is Computer based maintenance Software for small and middle sized companies. This project has just started. The first version is planed for the end of 2018. It's a web based application and open source. The project will be funded on targeted advertising (AdSense). After 3 months of work and probably more than 500 fails, I'm happy to present you my best video ever. Since magnets and marbles I've always wanted to make a big chain reaction in one take with this 2D style ! It's also a "one marble path" which means you have to follow the same marble for all the tricks (in that case the little blue one.) 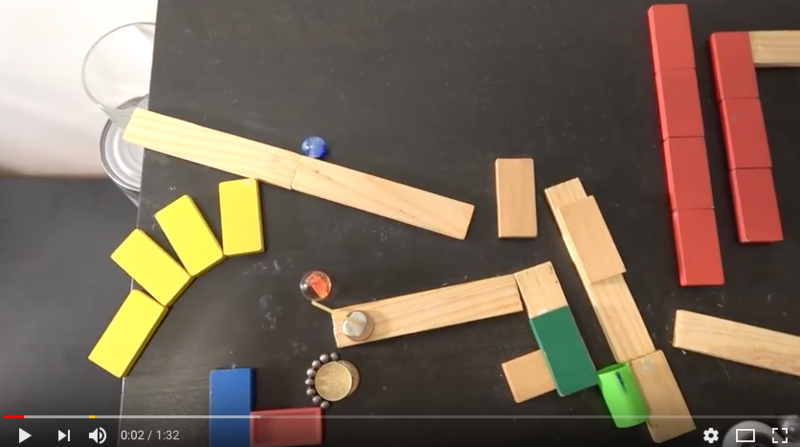 Because everything is in a tilted plane, the hard part was to find different ways of having the marble riding up along the table (magnets, falling weight, catapult ...). To do that, the marble has to be light. And because everything has to be triggered by this little marble, all the tricks are very unstable. Most fails happened when an element fall down earlier than expected. I learned a lot about chain reaction, and I discovered the amazing power of the hot glue gun !